Criteria Labs CL1010 is a high-performance InGaP HBT MMIC amplifier utilizing a Darlington configuration with an active bias network in a hermetic package. The active bias network provides stable current over temperature and Beta process variations. 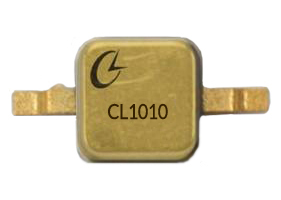 The CL1010 is designed for high linearity gain block military and industrial applications requiring excellent gain flatness, small size, minimal external components and hermetic packaging. Criteria Labs can provide various levels of device screening for military or high-reliability space applications.